The traded product's exchange symbol and the month and year of expiration. If blank is selected in either or both columns (Broker and OrderGW) indicating more than one available Broker and TT Gateway, working order and position values are combined for all Brokers and/or all order routing TT Gateways. 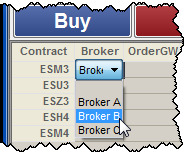 If only one Broker is selected (no OrderGW), working order and position values are filtered for that specific Broker only. If one Broker and OrderGW are selected, working order and position values are filtered as a combination of both (e.g., “BrokerB” and “CME-S” indicate working order and position values for BrokerB on the CME-S Gateway. If blank is selected (indicating more than one available TT Gateway for the contract), working order and position values are combined for all order routing gateways. If only one TT Gateway is selected, working order and position values are filtered for that specific gateway only. If an OrderGW and Broker are selected in a X_TRADER ASP environment, working order and position values are filtered as a combination of both (e.g., “BrokerB” and “CME-S” indicate working order and position values for BrokerB on the CME-S Gateway). A button used to delete all orders for the row. If an exchange trader uses this feature, all working orders for all sponsored proxy (TTORD) traders delete. If a TTORD uses this feature, it converts one message into to multiple individual delete requests to prevent them from deleting the exchange trader's working orders. A button used to send Request For Quotes. An icon used to display Market Depth. Note: The available market depth shown depends on the gateway and cannot exceed 50 levels. Launches the Algo Variable [OTA] dialog box seeded with the contract. Your estimated position in queue for working buy orders. The Group ID's total number of working buy contracts. Counterparty information of the Bid Member. The number of bid orders at each price level. The total quantity of resting Buy market orders. The total quantity working at the bid. Note: The Eurex exchange displays only four (4) digits in inside market. Therefore, the maximum Bid/Ask Quantity is 9999. This is a limitation of the Eurex API for UserDevices and MISSes. If the inside market is greater than 9999 and you wish to view that data, open Market Depth feature in the Market Grid. The Threshold bid price as established by the exchange. Exchanges set a trading range for the day based upon the previous session's settlement price. The exchange halts trading of the product when one of these limits is reached. A frozen market requires manual release by the exchange. The best market bid price. The accumulated bid quantity. Use only when you enable Market Depth. The average bid price. Use only when you enable Market Depth. The best indicative bid quantity. Note: Market Markers can provide indicative quotes when quoting certain products. These indicative quotes are displayed in these fields. These are not tradable quotes but an estimation of the market. The best indicative bid price. The best indicative ask price. The best indicative ask quantity. The average ask price. Use only when you enable Market Depth. The accumulated ask quantity. Use only when you enable Market Depth. The best market ask price. The Threshold ask price as established by the exchange. The total quantity working at the ask. The total quantity of resting Sell market orders. The number of ask orders at each price level. Counterparty information of the Ask Member. The Group ID's total number of working sell contracts. Your estimated position in queue for working sell orders. Buy quantity of spread units in a legged state. Sell quantity of spread units in a legged state. Buy quantity of spread units in a pending state. Sell quantity of spread units in a pending state. Undisclosed buy quantities hidden for Advanced Orders. Undisclosed sell quantities hidden for Advanced Orders. The last quantity. Behaves differently for each Gateway. For some (e.g., CME and NYSE Liffe), it is a cumulative total of all trades at that particular price. It sums the last quantity, while it remains at the current trading price. Once the trade price changes, the last quantity resets. For others (e.g., Liffe, Eurex and Xetra), it is the last traded quantity. The total traded quantity for the session. The high price for the session. The low price for the session. The opening price for the session. The closing price. Can be used to seed the Order Entry pane. The intra-day settlement price. This column is used for exchanges that provide intra-day settlements and help to avoid P&L issues that may be caused by unofficial and provisional settlement prices displayed in the Settle column. The settlement price. Can be used to seed the Order Entry pane. The difference between the last traded price and the previous session's settlement price. If there is no Settlement, the Close price is used instead. If there is no Settlement or Close price this field is blank. The percent difference between the last traded price and the previous session's settlement price. If there is no Settlement or Close price, this field is blank. Note: If the trader is displaying calls and puts with the same strike price on a single line, then there will be two sets of these columns. The indicative open price for the session. Note: When the indicative close price appears, the IndQty field blanks out. Note: If a contract has a Status of Auction the IndQty is Theoretical Open Price. The indicative open quantity for the session. Note: If a contract has a Status of Auction the IndQty is Theoretical Open Qty. The auction imbalance quantity. A positive value indicates more buyers than sellers and a negative value indicates more sellers than buyers. Free form text fields which accept up to 50 characters and can be used to link data from X_STUDY or outside applications. The maturity date formatted as DDMMMYY. The expiration date formatted as DDMMMYY.